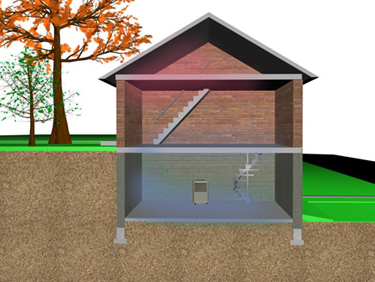 By insulating a home well, you not only lose less heat to the outdoors in winter but also reduce heat gains in summer. Shading is one of the simplest and most effective methods of blocking heat from entering the home. Many different methods are available to provide shade. EXTERIOR SHADING Although exterior shading is more effective than interior, because it blocks the heat before it enters the house, interior shading has the advantages of being easily controlled. An effectively planned landscape will block out the hot summer sun, encourage warming sun to enter the house in winter, deflect the cold winter winds, and channel breezes for cooling in summer. Shading your home - with trees and other vegetation - can reduce the temperature indoors by as much as 20 degrees on a hot day. Trees to the east and west of the house provide summer shading, while the area to the south of the house should be left relatively clear in order to allow solar heating in winter. Shading east and west walls and the roof is also important. Even trees which do not directly shade the house, such as those planted to its north, are valuable because they reduce the temperature of the air surrounding the house. Trees can provide shade to cool the house when needed, but need the sunlight go through during the heating period. Even deciduous trees that loose their leaves in the winter obstruct the sun. 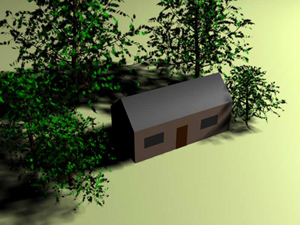 Unless deciduous trees on the south side of a passive solar home are located close to the house and the lower branches are removed, they will obstruct the sun. Trees, shrubbery, trellises (as in www.greenscreen.com), and grass, provide not only shade, they also can cool the air surrounding a home by as much as 9°F by the process called "transpiration". This is why rural areas with a lot of trees are usually cooler than urban settings. 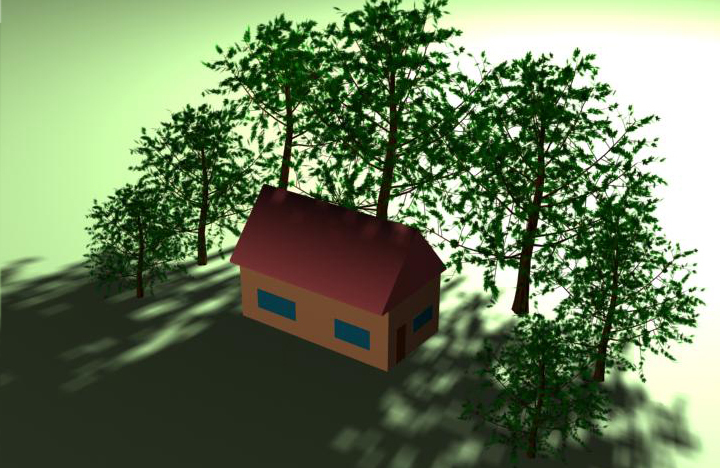 Cooling for a house is best done with deciduous trees. On the east and west sides of a house the sun strikes from a low angle early and late in the day, so it's best to plant bushes, smaller trees or evergreens, such as pines and spruces, there. On the south side of a home, however, it is best to have high-crowned deciduous trees that grow tall with few low branches. In the summer they shade the roof and south-facing wall. When they lose their leaves in the fall, they permit sunlight onto south-facing windows for solar gain. More regarding "Landscaping in the ""Avoid Paving" section" below. An overhang can be used on the south side of the house to block direct sunlight in summer without reducing the available sunlight in winter. The sun travels a higher path in the sky in the summer than in winter, so the overhang blocks direct sunlight from entering in summer, while the lower winter sun passes beneath the overhang. Overhangs work best on a south wall and window because the sun is at lower angles in the sky when it shines from the east or west, thus shining below the overhang. On east or west walls and windows, roof overhangs are rarely used. As mentioned earlier, low trees are best on east and west windows. To avoid trapping heat underneath the awning next to the window, the awning must have some means of allowing heat to escape, either through open sides or from a vent at the top. To be most effective, awnings should be light in color. In a climate with cold winters, use retractable ones to take advantage of the desirable winter heat gain. Exterior Solar Screens are capable of blocking up to 70 percent of all incoming sunlight before it enters the windows. Made of a thick fiberglass mesh which absorbs the sunlight, they are effective against diffuse and reflected, as well as direct, sunlight. 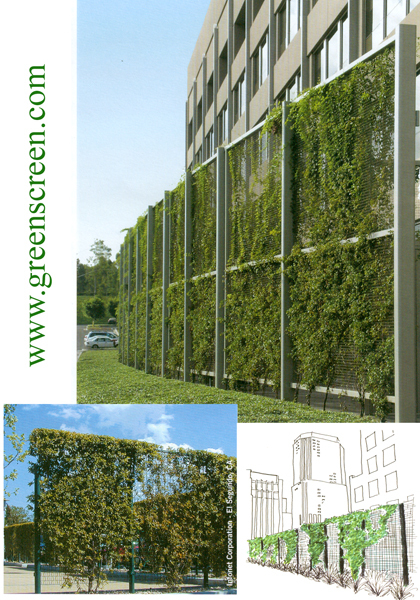 Because most varieties can also serve as insect screening, they also allow the use of natural ventilation. 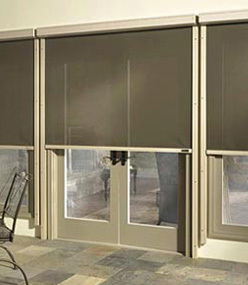 Shade screens may be ordered to size for a particular window or may be purchased by the roll and installed using special hardware that snaps in the window frame. Shade screens should be removed or retracted mechanically in winter to allow full sunlight to enter the windows. Shutters are moveable wooden or metal coverings that, when closed, keep sunlight out. They can be either solid or slatted, with fixed or adjustable slats. Besides reducing heat gain, they afford privacy and security. Some shutters can help insulate windows when it is cold outside and can be opened during the day to capture the desirable winter heat gain. Although they block sunlight very effectively, they have a few disadvantages: they obscure the view from the window, block daylighting, and may be inconvenient to operate on a daily basis. Rolling shutters have a series of horizontal slats that run down along a track. Rolling shades are similar in design but use fabric. Although both options are expensive, they work well and many models can be conveniently controlled from the inside. One disadvantage is that they block all light when fully unrolled. While interior shading is not as effective as exterior shading, since it is unable to block heat until it has already entered the building, it can still be a useful supplement to exterior shading. Although Venetian blinds are not as effective as draperies, they can be adjusted to let in some light and air while reflecting the sun's heat. 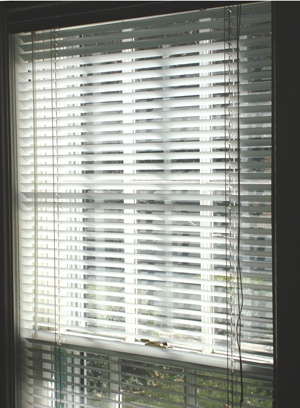 Some newer blinds are coated with reflective finishes. To be effective, these reflective surfaces must face the outdoors. Some window manufacturers even offer "mini-blind" louvers built-in between the glass of dual-pane windows and skylights. Curtains or drapery can make a good insulator at night. Reflective Films and Coatings (more on coatings in "Windows") Reflective coatings which adhere to glass can block up to 85 percent of incoming sunlight. Some coatings may be applied seasonally; others are permanently affixed to the glass surface. Permanent films or coatings are not appropriate for south windows in passive solar homes, since they would block heat from entering all year round. However, they would be practical for unshaded east or west windows. Window films are not recommended for windows which receive partial shading; the film absorbs the sunlight and will cause the glass to heat unevenly and possibly crack. The reflective surface reflects most of the radiant heat striking it, and it will itself emit very little heat. Radiant barriers come in many different forms: single-sided or double-sided foils, foil-faced insulation, and multilayered foil systems with air spaces. Any of these products should perform equally well if properly installed. 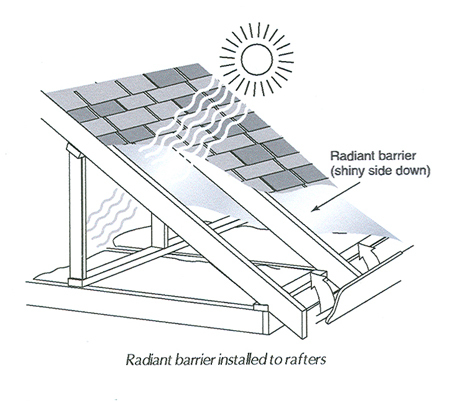 To work properly, the shiny side of the radiant barrier must face an air space. In an attic, this is done by stapling the radiant barrier, shiny side down, to the underside of the roof decking or the roof trusses. The orientation of the shiny surface itself does not matter; it will reflect heat equally well whether it points up or down. What is important is that the surface remains shiny. Hanging the radiant barrier with its shiny side down prevents dust from accumulating on its surface and reducing its ability to reflect heat. Much heat comes from the occupants and the appliances they use. By carefully selecting appliances and the times they are used, one can minimize heat generated. The less efficient an appliance is, the more waste heat it generates; thus, its inefficiency costs in two ways: the extra energy to run the appliance and the cooling penalty that comes with having to remove the extra heat it generates. Most major appliances come with energy-guide labels that show how much energy the appliance will use. Remember that you will continue paying for the appliance long after its purchase due to the energy it consumes, so the one that appears least expensive at first may not be so in the long run. Kitchen and laundry appliances produce heat. In the kitchen, use a microwave oven or a smaller toaster oven rather than the large oven whenever possible. Serving cold dishes will be refreshing and cut down on the amount of heat added to the house at mealtimes. Cooking dishes in the evening to be served later (either cold or reheated in the microwave) shifts the added heat of cooking away from the already warm dinner hour. Cover pots and pans. Less energy will be needed to cook the foods, and little heat and humidity will be added to the house. If boiling in an open pot is necessary, be sure to turn on the kitchen exhaust fan so that it can help remove the humidity introduced by the steam. Conside using the outside BBQ in the summer months. When doing laundry, wash only full loads and use cold water whenever possible. It will save the energy needed to heat the water, and lessen the addition of warm, moist air in your laundry room. Consider using a clothes line. Dryers are one of the most energy-consuming home appliances. Lighting: Use energy efficient light source, such as HID or LED lights since they radiate less heat. See: "Lighting" for more info. A breeze allows your body to lose heat more effectively, but it should come from planned ventilation of fans, open doors, and windows rather than the uncontrollable leakage of air through cracks and gaps in the house's structure. Ventilation, or the movement of air, is one of the most powerful means of achieving a cool home. Ventilation has two goals: (1) to remove heat from the house and (2) to provide air movement within the house to cool its occupants. For ventilation to succeed, there must be both an inlet and an exit for the air. In other words, windows on both the windward side and the leeward side of the house need to be open to promote air flow. CEILING FANS Ceiling fans provide localized breezes which blow past your body and help it lose heat more efficiently, giving you the perception that the temperature is about 4 degrees cooler than it actually is. So the air conditioner thermostat setting may be raised from 2 to 6 degrees above what would otherwise be considered comfortable. 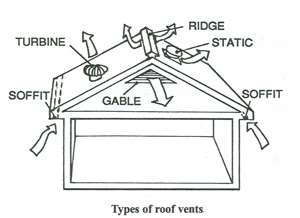 ATTIC AND ROOF VENTILATION Proper ventilation between the roof and the insulation helps reduce roof and ceiling temperatures, thus saving on cooling costs and lengthening the life of the roof. Vent types to choose from are ridge, gable, soffit, static mushroom, and turbines. Paving causes higher ground temperatures and more reflected heat. If possible, use lawns and plants on your home's surroundings instead of paving the ground. Especially dark colored roads, parking lots and roofs (low albedo) cause a raise in temperature as much as 12 degrees Fahrenheit. Also, an increase in ambient temperature causes an increase in ground level Ozone. Keep shrubbery to cool the home and surrounding areas due to Evapotranspiration. 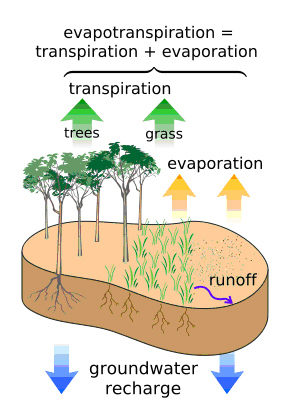 Evapotranspiration is the transpiration of groundwater by plants whose roots tap the capillary fringe of the groundwater table. Transpiration accounts for the movement of water within a plant and the subsequent loss of water as vapor through stomata (pore) in its leaves. Therefore Courtyards will serve you well hot dry climates zones, a tall-narrow shaded open courtyard next to daily living areas are an effective way for cooling. A Green Roof can cut much of your heating bill system. It can be an extension of the existing roof which involves a high quality water proofing and root repellant system, a drainage system, filter cloth, a lightweight growing medium, and plants. Green roofs are becoming more and more popular in the US. Although Green roofs have some important advantages over traditional roofing, they involve higher costs, higher maintenance, and some potential problems that should be taken into account. More information in "Green Roofs."